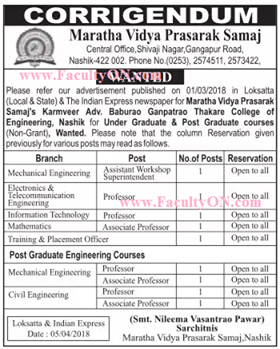 Maratha Vidya Prasarak Samaj, Nashik has advertised in Loksatta newspaper for the recruitment of Professor/Associate Professorjobs vacancies. Interested and eligible job aspirants are requested to apply by earleist. Check out further more details below. About College: The Maratha Vidya Prasarak Samaj is one of the most prestigious centers of learning in the State of Maharashtra. It has been over 100 years that it has stood the test of time to become legend of unparalleled stature. History says that the credit for the birth of M.V.P.Samaj goes to the young, enthusiastic and devoted team of social workers and educationists who were inspired by the lives of Mahatma Jyotiba Phule, Savitribai Phule and Rajashri Shahu Maharaj of Kolhapur.